Christopher David Gray is a freelance journalist. Both Morton brothers worked at the Ford plant on the far South Side like their father before them: Brian was a materials handler, and Greg, a quality control inspector. But about 10 years ago, both men saw the auto industry in decline, and they left their comfortable union wages and benefits to strike out on their own. "I left, cold turkey," said Brian, in his signature white-on-white White Sox cap. He owns the new fast-food restaurant chain Just Turkey with his brother. "I just had this entrepreneurship thing in me." Since starting in Calumet Park in 2008, the Morton brothers have grown Just Turkey to six locations, three in the city and three in the south suburbs. True to their name, they sell just turkey -- no pork, beef, chicken or fish. "It was a gamble," Brian said at the Just Turkey restaurant on Cottage Grove in Bronzeville. "I had people come to me saying, 'You can't sell only turkey. You'll never make it.'" They sell turkey burgers, turkey hot dogs, turkey Polish, turkey tacos, turkey nachos, turkey chili, turkey spaghetti, turkey lasagna and turkey salad. They even sell turkey ribs and turkey tips. "It just seems like the African-American community gravitated to it right away," Brian said. "Within the first year, we were already in the profits." Greg doesn't eat pork, and the brothers bill their food as a healthy alternative to the food that's more commonly sold in Chicago's black neighborhoods and food deserts. While still heavy on animal products and light on the plant-based food -- they recently added salads, wraps and mixed greens to the menu -- their grilled turkey is healthier than the fried chicken and fish sold next door at the popular chain Harold's Chicken. Twon Price, a barber who works nearby, said he eats at Just Turkey every day. "I don't like it. I love it," said Price, taking a break from his turkey lasagna with spinach. Just Turkey wasn't the Morton brothers' first investment-- Greg stuck his hand into the real estate business, while Brian used money from his buyout from Ford to set up a recording studio, where he helped produce the Ludacris album Battle of the Sexes. "I just felt I wanted to do something more than work in a factory all my life," said Greg. "The sky's the limit. If you're working for somebody else, it limits your sky." After the housing market went south, Greg was looking for a new venture. And while Brian remains just as passionate about hip-hop music as ever, he wanted something more reliable. "The music business was a bird-in-the-bush type business," he said. "This is bird-in-the-hand." They had always liked grilling out, enjoying turkey the way others might barbecue pork. Kathy Edwards, who now manages one of their stores, convinced the brothers to go into the food business, using many of her turkey recipes. Just Turkey orders their ground turkey from Perdue, but the rest comes directly from a turkey farm in Ohio. "The first one was so successful, we knew we had something there, and we just expanded," Brian said. 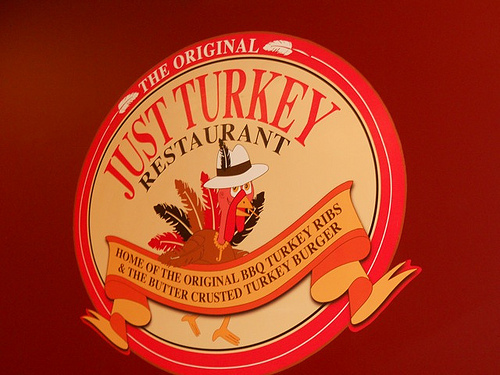 The original Just Turkey outpost in Calumet Park is temporarily closed, pending a move down the street to a bigger location with more parking. Their other locations are in Homewood, Lansing, and in the Chicago neighborhoods of Beverly and Galewood, north of Oak Park. I tried the turkey rib tips, which were served in a basket, drenched in their special tangy barbecue sauce, along with an order of french fries. 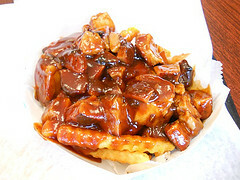 I couldn't have distinguished the tips from good pork barbecue, and the sauce was spicy without overwhelming the palate. Brian says he'd like to open shop in the Loop, but their next move is to establish a franchise license with the state and set up a corporate office. He is interested in opening up franchises in Las Vegas, Los Angeles and Atlanta. "I want to take these all across the country," he said. The entrepreneur spirit is what keeps our country alive. Good for them. Thanks for the post.